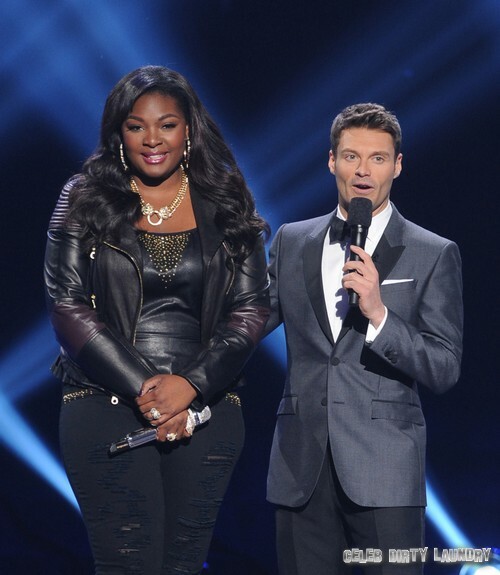 Candice Glover, from St. Helena Island, South Carolina won AMERICAN IDOL having received the most amount of votes, she has now been crowned the winner of season 12. Before Idol, Candice was an insecure person. She didn’t think she was all that beautiful as she struggled with her weight. In an interview, she said she had to have counseling at school because of her insecurity problems. When Idol ends, Candice says she wants to be a guidance counselor to help girls through what she went through as a young adult. All the way back to her audition, it was hard not to see that there was something special about Candice. Her all time favorite singer is Jazmine Sullivan. Jazmine retweeted Candice’s rendition of “Chasing Pavements” by Adele saying her song was, “Amazing!” Jazmine inspired Candice to make each and every song her own. For her coronation song last night, Candice sang a song called “I Am Beautiful”. [VIDEO HERE] and the judges loved it. Candice closed out the show with “I Who Have Nothing”. [VIDEO HERE] She received a standing ovation from all four of the judges. Keith said she’s such a powerhouse singer and the song is like a planet exploding to life. It was incredible. What did you think of Candice, did you think she deserved to win? Sound off your comments below and let us know what you think of Candice’s Idol experience. Who Won American Idol Tonight 5/16/13?